Composer Rupert Gregson-Williams is not new to the superhero genre in the DC universe. 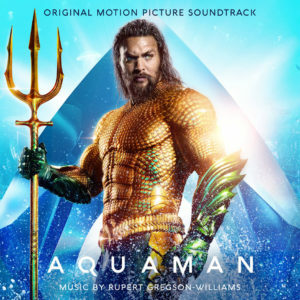 After writing the music for Wonder Woman last year, he was also given the job to compose the music for Aquaman: a superhero whose mother is from the underwater world of Atlantis and who has a human father, which makes him a man of both worlds. 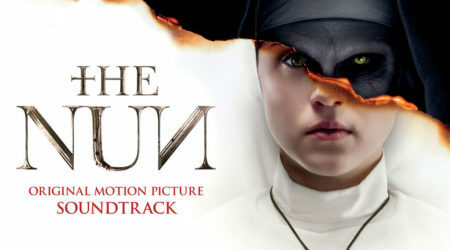 The first thing I noticed while listening to the score was that the music is from both worlds as well, since it contains a mix of orchestral and electronic music. “Arthur” is the most important track on the album because it represents Aquaman. The theme, performed by electronics, comes in silently from the distance until the orchestra joins in with loud trumpets. Afterwards the track transforms into a dance track. I am not a big fan of dance music, but this track, with the melody of the Arthur theme, really sticks, and I kept nodding my head with the beat while listening to it. I love the way an amazing hero theme is integrated in dance music. It is also clear that this track was specifically written as a stand-alone piece, which can serve as basis for the rest of the score. “Swimming Lessons” has the theme with a big orchestral sound. In “Suited and Booted,” the theme contains even more electronics, and in the version that can be heard at the end of “Map in a Bottle,” you can hear a more delicate version. In addition to the main Arthur theme, there is another theme really standing out on this score, which I would call the Mother theme. It can be heard for the first time in “It Wasn’t Meant to Be,” where you can hear a very sad melody, beautifully played on a duduk, but you can also hear the same melody on the piano and by the full orchestra in the same track. In “What Would Be Greater Than a King?” the theme returns in its full glory. It still sounds a bit sad, but when it is played by the full orchestra, it transitions into something more magnificent. In “Reunited” the theme is different, it is more grown-up. The sadness in the melody is gone as the orchestra and choir make it more uplifting and a clear conclusion can be heard at the conclusion of this track. The way Gregson-Williams uses this theme throughout the whole movie is a great example of how one simple theme, performed differently, can be used for story telling. The third theme represents the evil that occurs in this movie. It is not really melodic, but more of an electronic all low sounding pattern. You can listen to a march-like version of this pattern in “Atlantean Soldiers.” In “The Ring of Fire” it features in the background. The same evil sounds can be heard in “The Black Manta” where they are used in a three note descending pattern. In addition to the themes, there are some tracks that I want to highlight. As with the Sigrid song for Justice League, this movie also has an important song, which is “Everything I need” by Skylar Grey. You can find both the film and radio version on this album. The melody of this song, however, really shines in “Between Land and Sea” where Gregson-Williams has integrated the music in the score. “Permission to Come Aboard” uses electric guitars that you hear not that much on this album, but also a couple of seconds of small acoustic guitars can be experienced before the track ends with the evil pattern. “Kingdom of Atlantis” is fully electronic and beautiful melodies in this track sound very futuristic, in contrast to “The Legend of Atlan,” which contains the same melody but is fully orchestral. Finally, in “He Commands the Sea” Gregson-Williams uses the full orchestra and choir together with a lot of electronics for a victorious sounding piece. Next to the song by Skylar Grey, two other musical pieces, which are not written by Gregson-Williams, can be found on the album. The first one is “Ocean to Ocean” by Pitbull and Rhea, which is a weird mix of hip hop and the song “Africa” by Toto. The second one is a hectic, unnerving sound design piece called “Trench Engaged – From Kingdom of the Trench” by Joseph Bisara. One thing about this album that caught my attention is the fact that the music is not ordered chronologically – which to me looks that care and attention went into creating this album. The order makes the score part a pleasant listening experience. Luckily, the songs, which I do not care for at all, are at the start and at the end, making them easy to skip. The one thing that I like the most about this score is the balance between electronics and orchestral music, which gives the music a modern twist, while still keeping the score melodic and a pleasure to listen to. The Mother and Arthur theme really stand out, and I did not mind listening to them constantly while reviewing this score. The movie itself was very entertaining, and I think the music was one of the reasons for this.